For a chamber music duo like ours, not only do we have to practise alone, we also need to rehearse together. Just putting in the hours, however, is not enough. I have come to the conclusion that we need to clock in performance time. Performers use tryouts — a concert before a concert — to get ready. It’s the step between the last rehearsal and first important performance. For a chamber music duo like ours, not only do we have to practise alone, we also need to rehearse together. Just putting in the hours, however, is not enough. I have come to the conclusion that we need to clock in performance time. A pilot’s flying experience is often measured by his flying time. No amount of flying inside a flight simulator can substitute for actually flying a plane full of passengers. However, not all planes and routes are equal. Cargo and passengers are different. Short haul is different from long haul flights. Similarly, not all concerts are equal. A house concert is very different from a big public concert hall. Playing at a nursing home is different from playing in a museum. Is it then possible to practise performing? 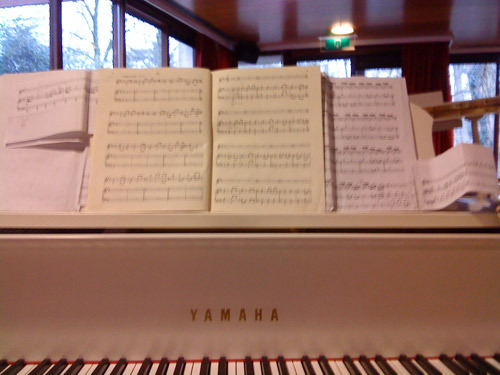 After our first concert of our 2010 programme in Doorn in January, I practised even harder. 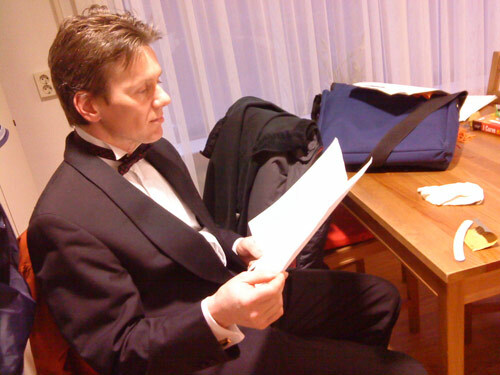 At our second concert in Amsterdam, I realised that I should focus on what I thought were easy pieces. I had spent so much time gaining confidence on the difficult pieces, that I had underestimated the challenge of playing the easy pieces in sync with the guitar. The more we perform, the sooner we will be ready to record our second CD. That is our ultimate goal: to record a CD so that we can move on to new repertoire. We want to reach that stage, as we did in 2009, of being so confident in our playing that we can perform anytime anywhere without any advance notice. Having reached that point in 2009, I long to get there with our new programme. And so, we accepted a last-minute request from a composer to perform his work at a private party. We offered to play a few pieces from our new programme at another private party the following week. We deliberately challenged ourselves to play to a knowing audience of culture vultures, composers, musicians, and real aficionados of classical music. We were the invited guests, just like everyone else, but we put ourselves to work before we could indulge in the wine and festivities. Those two occasions in Amsterdam were “tryouts” for us. “Tryout” translates to “please forgive us if we make mistakes or don’t deliver the quality we intended.” Tryouts are usually free because the performers need the audience, not the other way around. Performers use tryouts — a concert before a concert — to get ready. It’s the step between the last rehearsal and first important performance. Perhaps our duo will offer to “tryout” a piece as a surprise. Probably not.